It’s August in Havana. The scarlet flamboyanes* are beginning to shed the blossoms that have been an explosion of color ever since May. We start seeing the first avocados and those incredible mameyes. ** And there is heat, heat and more heat. Late in the afternoon, we get torrential rainfall that seems to be announcing the end of the world. Warm fat raindrops are barely able to cool down the scalding pavement. Kids run out into the rain and play in the puddles. And then it suddenly stops. With a bit of luck, we get a fleeting rainbow, but the gorgeous sunset is a regular feature. When the evening rolls in, especially in the downtown areas where houses are close together, people sit on the sidewalks to chat and play dominoes. Out come the chairs, the music, the fans. This often goes on till midnight or later, when the night air brings some relief from the heat and finally one can get some sleep. The Havana Malecón also fills up with folk who are searching for some breezes or groups of young people with guitars, lovers, street vendors. 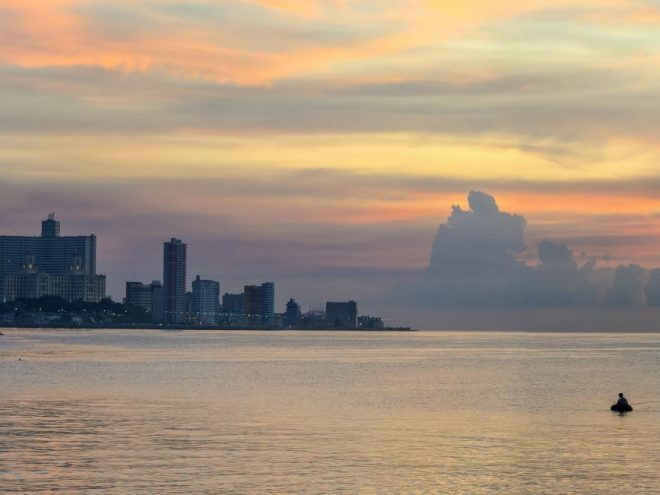 At sunrise, the sea is remarkably calm, smooth as glass—“like a plate” is the Cuban expression. Cubans love to go swimming in this almost warm waveless sea; it’s an amazing blue like the cloudless sky. Those who are able to afford it, rent houses by the beach and others are just happy to go swimming every day at Playas del Este—the beaches to the east of Havana. They go by bus, taxi, motorcycle or whatever other transportation is available. Or they go to the beaches that lie to the west, which are a little closer—but not as pretty—and they all return in the late afternoon, tired, salty and happy. Houses generally keep their windows and even their doors open, waiting for the welcome breezes of fresh air and visitors. Friends and relatives arrive from other provinces to spend a few days in the capital. These are days for happy get-togethers, some drinks or beers, going to the circus, puppet shows for kids, the zoo or the aquarium. City streets are overrun by pedestrians and the public transportation is more impossible than usual. Queues at the popular Coppelia Ice Cream Parlous in Vedado are longer than ever. You start to see people with tans; skirts get shorter and necklines drop. And for those of us who choose to stay at home, national TV channels have special programming that includes copious packages of kid’s shows and endless movie shows. The kids are out of school and their parents have saved up their holiday time and their money for the summer. Some mothers, however, who have to go on working take their children to the office and so it’s not uncommon to see many workplaces filled with youngsters who are allowed to take over by common consensus. ­­­­­­­­­­­­­­­­­­­­* Flamboyan: flowering tree noted for its flamboyant display of flowers, hence the name. In English it is given the name of Royal Poinciana or Flamboyant. It is also one of several trees known as Flame tree.